Originally shot in 2009, it has taken five years for Busby Furball to reach the screen of a cinema. Earlier this evening, it had its world premiere in the QFT as part of Belfast Film Festival. As I expected, the Factotum arts collective excelled themselves with a surreal masterpiece that combines life, birth, death, experimentation and extinction into 30 minutes of fantastic cinema. It’s the story of three Busbys who lived together on an isolated peninsula. A little like the gorillas in Dublin Zoo. Except they’re more erect, a lot more colourful, and speak in native Norn Irish. It would be genuinely difficult to spoil the plot. Giblet (red fur) is the boffin, tinkering in his square brick house and trying to understand how sounds relate to thoughts. He uses his steampunk “metal” detector to analyse rocks and bottles. Offal is his “guileless” friend: the type of friend you look down on and wish to experiment on. Offal becomes pregnant after picking up and playing with an oversized fungi. He gives birth to Oscar, an oversized slug. Poylp (black fur) stands in the middle: helping Offal overcome the taboo of experiencing the hallucinogenic effect of eating his own furball. Yet Poylp is also willing to collaborate (in the Nazi sense of the word) with Giblet to use a brain portal machine to get right inside Offal’s head. The film is replete with Blake’s 7-style sound effects, grunts, groans and local vernacular. While the busbys’ eyes don’t move, they’re still very expressive. Their hair moves in the wind mirroring the swaying and swirling grass. The props are amazing, particularly the rotating ornamental cake stand. And Oscar’s sluglike movement across the grassy fields is straight out of the K9 manual and worthy of the creation of an Oscar (award) category for animatronics. Having been made in quite a rush [ahem!] the film is still a little rough around the edges. There’s only one camera angle where it rains: maybe Giblet has successfully applied a polaroid effect to precipitation? And the chapter introductions that partition the film nearly reveal too much about the otherwise totally surreal and imagineering plot. From the giggles and wails of laughter across the QFT tonight, the actors and crew obviously had a (fur) ball making the short film. A film that questions how clever the self-appointed wise people in society really are. Are we really open to appreciating who is in charge of our destiny? And who is experimenting upon whom? Perhaps there are some spiritual insights in there too: “Verily I say unto you, inasmuch as ye have done it unto one of the least of these my brethren, ye have done it unto me” (Matthew 25:40). Every year, the Belfast Film Festival gets better and better. Except for the festival programmer’s knack for scheduling loads of great films on the same night. I blame that on Stephen Hackett … though with so many movies to choose from, the clashes are perhaps inevitable and forgivable … though at some stage the festival should invent a BFF+1 concept to re-screen each film a day later! With a mix of local and international films, there’s plenty to tickle your fancy, challenge, entertain and offend. Out of the 121 films on offer over the 10 day festival here are a few that caught my eye. Ticket prices for the selection of films and events below vary between £3 and £6. 16:00 – Quatermass Xperiment – QFT – A manned missile is launched and lands in the English countryside, with two of its three crew members missing. The third undergoes a horrible metamorphosis and starts to kill humans and animals. (The film was later remade as a 'live' production on BBC Four.) Prof Quatermass pieces together the logical conclusion: an alien invasion. Renée Glynne worked on the film and will give a talk from 2pm before introducing this science fiction cult film at 4pm. Having sat through a long and late night screening of Quatermass And The Pit in a BBC studio as part of a previous Belfast Film Festival, science fiction fans will be glad to see this one is scheduled earlier in the day! 18:00 – Busby Furball – QFT – when I looked at the image accompanying the write-up in the Belfast Film Festival programme I knew this had to be a Factotum production. (Their film Ditching is one of my favourite pieces of local cinema.) 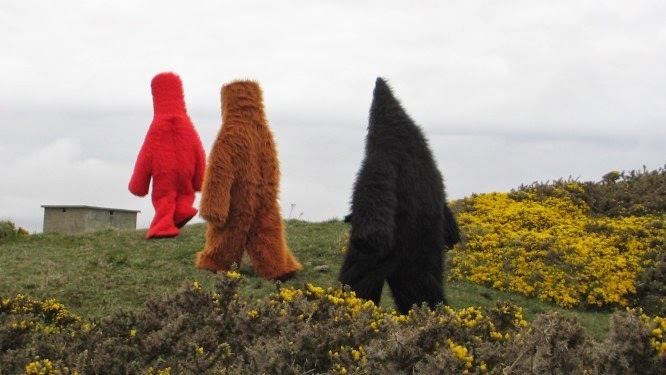 Three hairy Busbys – Offal, Giblet and Polyp – live on an isolated peninsula. Mind control, oversized fungi, giving birth to a large, intelligent hairy slug, a brain portal and some mind control. 28 minutes of cinema I’m really looking forward to. Reviewed. 19:00 – The Distance – QFT – A surrealist heist film starring three telekinetic Russian dwarves who are hired by a long-suffering Austrian artist to rob a guarded room in a remote power plant in the Siberian Mountains. Their telepathy melds together many different languages, backed by an atmospheric soundtrack. 19:00 – Drawing on Life – BFF Beanbag Cinema, 23 Donegall Street – A local documentary tracing the thoughts of leading architects as it explores how and why they still draw by hand in this digital age. 19:00 – Onus – Dublin Road Moviehouse – No budget (£500) feature film from Belfast-based George Clarke/Yellow Fever Productions. Shot in nine days over two years in Norway, expect dark twists as two sides of the same coin are examined. 21:00 – Noirland – Dublin Road Moviehouse – Northern Ireland’s first crime anthology from writer/director Philip Henry. Three stories following one man who wants “to see the guilty punished, because secrets never stay buried in Noirland”. 18:45 – We Were There – Dublin Road Moviehouse – How the Maze/Long Kesh impacted on women’s lives, through absence from family as well as intervention by educational and welfare staff. Recorded in 2007 inside the empty prison, stories told by a prison officer’s wife, inmates’ relatives, Open University tutors, Probation Service staff and a visual artist. Followed by a Q&A with participants and the filmmakers. 19:00 – The Lunchbox – QFT – A mistaken delivery in Mumbai’s famously efficient lunchbox delivery system connects a young housewife to an old man in the dusk of his life as they build a fantasy world together through notes I the lunchbox. 19:00 – The Dirties – QFT – Owen and Matt decide to make a no-budget epic action farce as they take revenge on their high school bullies. When it doesn’t work out, they switch to make a documentary that reveals more about their own selves that they are comfortable with. 19:30 – Baraka – Townsend Street Presbyterian Church – ‘Baraka’ is an ancient Sufi word which can be translated as “a blessing or as the breath, or essence of life from which the evolutionary process unfolds”. In this spiritual nonverbal film with no plot, no actors and no script, expect breathtaking shots from 24 countries on 6 continents that show the beauty and destruction of nature and humans. 14:00 – Sleepless Nights – QFT – Exposing the concept of clemency without justice in the Lebanon as a mask that protects the perpetrators and leaves survivors with festering wounds. A moving documentary about reconciliation and justice bring together a guilt-ridden former Lebanese Forces intelligence officer with a mother who is still searching for her communist fighter son who disappeared in 1982. The war ended in 1991 with an amnesty for political crimes. But what is the legacy from that decision? 19:00 – A Story of Children and Film – QFT – Mark Cousins’ personal cine-essay about children on film: a mosaic of clips from 53 films made in 25 countries. 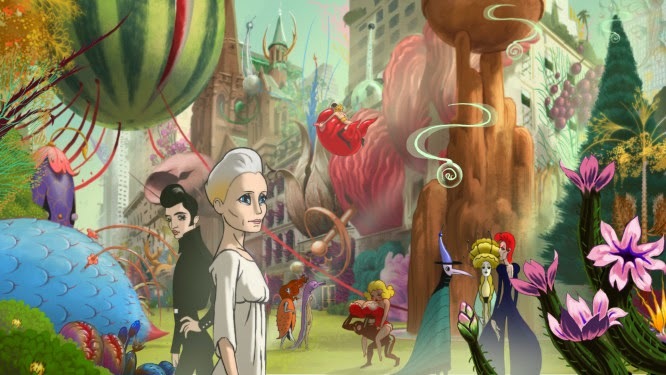 21:15 – The Congress – QFT – Blend of live action and psychedelic animation, science fiction set in a dystopian Hollywood. 18:45 – Border – QFT – A powerful account of contemporary Syria as two sisters learn that a member of their family has decided to desert the Syrian Army and join the Free Army embarking on a hazardous journey to Turkey. 19:00 – Europa Report – Dublin Road Movie House – A privately funded space exploration company sends six astronauts to confirm whether a hidden ocean suspected to lie beneath the icy surface of Europa could sustain life. Near catastrophic technical failure, communication loss and a death as the astronauts overcome psychological and physical toll of deep space travel in this science fiction thriller. 19:00 – I am Belfast: Fragments of a work in progress – QFT – A talk by cinematic flâneur Mark Cousins and composer David Holmes on the making of their new film and the process of writing the music as the film is shot. Will include the first screening of 10-15 minutes of the film. 19:30 – Votes for Women – Culturlann – The story of how Irish women obtained the vote in spite of every main political party in Ireland and Britain opposing women's suffrage in the lead up to the First World War. But women along with a minority of socialist men rose up and eventually secured the vote for over 30s in 1918. Another aspect to the decade of centenaries. 19:30 – Babette’s Feast – Bloomfield Presbyterian Church – Two daughters of a Danish coastal clergyman live a pious and self-sacrificial life. But Babette, a mysterious refugee from France’s civil war, arrives and convinces them to try something outrageous: to try a gourmet France meal. The town are upset and convinced they’ll lose their souls for enjoying this earthly pleasure. 21:00 – Here Be Dragons – QFT – Old cartographers used to label unexplored areas of maps with the legend “Here Be Dragons”. In this film essay, Mark Cousins explores the political, cultural and cinematic landscape of Albania. 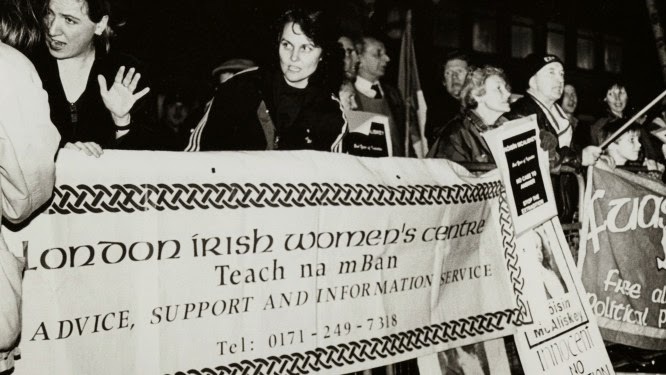 19:30 – Breaking Ground – BFF Microcinema, 23 Donegall Street – A 63 minute documentary about the work of the London Irish Women’s Centre from its opening in 1983 to its closure in 2012. 19:30 – Gospel According to Matthew – Clonard Monastery – Director Pier Paolo Pasolini’s passionate and poetic retelling of the story of Christ from immaculate conception to death of the cross. Depicted as a fiercely political figure who attacks hypocrisy and social injustice. Dialogue drawn directly from scripture. Recommended by both the Vatican and the Archbishop of Canterbury! 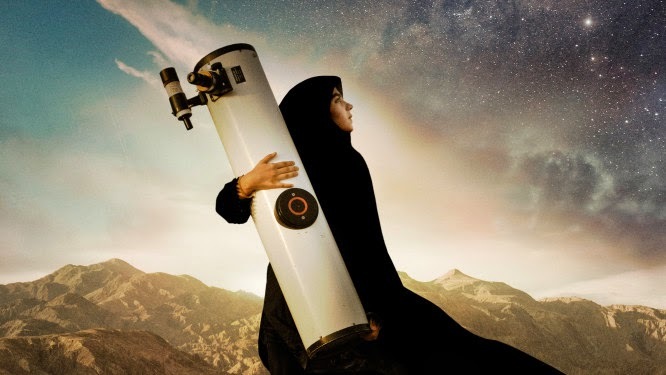 14:30 – Sepideh Reaching For The Stars – QFT – Inspired by Anousheh Ansari, the first Iranian in space, teenage Sepideh lugs her enormous telescope into the countryside to study the heavens. This “unladylike behaviour” isn’t appreciated by everyone in her family. Her passion is to pursue a university education; yet suitors come knocking on the door. Breath-taking constellations together with life-changing moments in Sepideh’s life. Reviewed. 19:00 – The Human Scale – BFF Microcinema, 23 Donegall Street – The proportion of the world’s population living in urban areas is estimated to rise from 50% to 80% by 2050. Danish architect Jan Gehl argues that we need to build cities that take into account human needs for inclusion and intimacy rather than continuing to create cities that repel human interaction. This film asks what would happen if we put people at the centre of our planning. It wasn’t the first time that The Great Nivelli had returned to his home town. Standing on the theatre stage in his magnificent cloak triggers memories of Ernst’s war-torn childhood, crouching in the cellar while Allied bombs caused destruction overhead, being evacuated to Tante Sophie’s farm in the countryside, and making the long trek back with a new enigmatic acquaintance ‘Mr H’ to try to find his mother at the end of the Second World War. The star of last night’s show is young Ernst (played by Sam Clemmett) who grows up and becomes more confident as he picks up life-skills on his journey* home. The once shy child becomes adept at getting his own way in tricky situations. Mr H (Bob Kelly) is like a father to him, and ultimately he takes his name. Dan Gordon plays The Great Nivelli, and is joined on stage by Kerri Quinn, Abigail McGinnon, Michael Lavery and Faolan Morgan. The dark atmosphere of the war is conveyed through Garth McConaghie’s sound effects, the dimly lit set (designed by Sabine Dargent), the use of shadow and the industrial smoke machines that waft low lying fog across the stage. The mood is lightened by illusions and expertly performed close magic tricks (white gloves, handkerchiefs, canes, the works! ), and there are plenty of giggles from the audience, particularly during the lesson on shrugging. Charles Way’s play doesn’t have all the answers. Many of the pared down scenes from last night’s performance lived on in my imagination as I drifted off to sleep, conjuring up the characters’ stories after the lights went down and the actors left the stage. This pivotal line in the middle of the play explains why the skulking, scavenging Mr H is willing to walk hundreds of miles to take Ernst back to his roots. The Great Nivelli’s career and touring magic show are really his grown-up tribute to all Mr H gave him, his way of recompensing his sadly unspoken gratitude. Only an hour long, the play seemed to keep the attention of the younger children in the audience, and left them wanting more. Expect to laugh. Expect to feel slightly nervous. Expect a tear to escape your eye near the end and trickle down your cheek. Expect to learn about the war from the less-spoken-off other side. Expect to dream afterwards about hens and red balloons and magic. Directed by Paul Bosco Mc Eneaney and produced by children’s theatre company Cahoots NI, Nivelli’s War is a beautiful and touching show that runs in The MAC until 11 March before going back on tour – Cookstown, Castleblaney, Letterkenney, Dun Laoghaire, Enniskillen and Warrenpoint – throughout the rest of March. Brilliant theatre and suitable for 7 year olds and up. Well worth a visit, and a great imagination-boosting lead-in to the Belfast Children’s Festival that starts on Friday. *Warning: this play contains journeys! Imagine an elevated three-lane motorway encircling Belfast city centre. A mini-M25 taking through-traffic off the inner-city streets, serving all parts of the city equally? Imagine the noise and pollution from an above ground ring-road, jammed full beyond its intended capacity, severing communities with its concrete and tarmac. A monument to the victory of private over public transport? 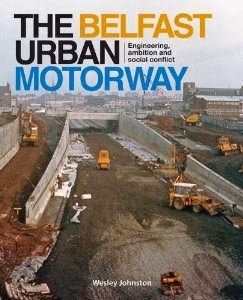 Wesley Johnston’s new book The Belfast Urban Motorway looks back at the economic, engineering political and social forces that shaped the major transport decisions in Belfast and beyond over the last sixty years. From the power of the Belfast Corporation, to direct rule ministers and policies from London; from communities being bulldozed for ‘the greater good’, to direct action and strong community lobbying; from the rule of cars, to a more balanced private/public transport strategy. In the 1800s, bridges were being built across the Lagan and demolished within a generation to be replaced with larger ones. In parallel with road expansion, the rail network across Ireland was still growing: 1839 saw the Belfast to Lisburn rail link open (175 years old in 2014! ); Ballymena, Carrickfergus and Holywood in 1848; and finally Belfast to Bangor in 1865. Those sites of road congestion in the 1920s and 1930s will be familiar to 2014 drivers! 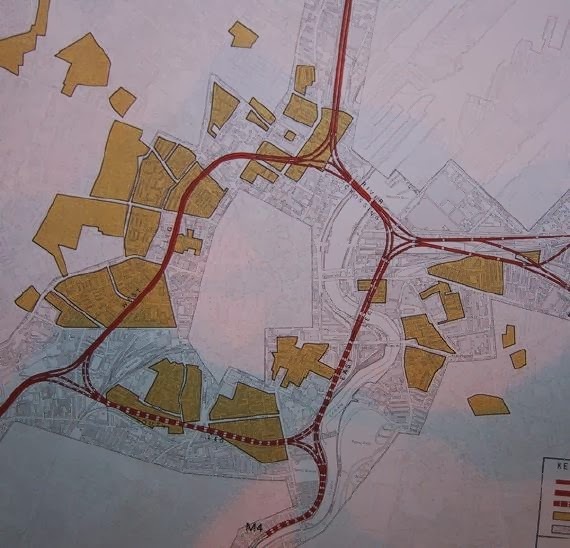 Plans for a province-wide motorway network and large approach roads converging on Belfast were formulated in the 1950s and the Belfast Corporation was keen on a ring road around the city. In 1960 the Minister of Health and Local Government [there’s an interesting mix of areas for a department!] appointed Sir Robert Matthew to draw up a regional plan for Belfast, covering housing as well as transport. Prof Matthew’s report proposed “a ‘stop line’ beyond which the city would not be allowed to expand”. Wesley Johnston notes that “with a few exceptions such as Poleglass and Cairnshill, this stop line remains more or less intact to the present day”. People living in sub-standard Belfast housing would move to seven existing towns and the entirely new city of Craigavon. Prof Matthew also backed the plans for the urban motorway around Belfast city centre. The book explains that four civil engineers travelled to cities in the US in 1963 and the visit “really reinforced our view – that the elevated motorway was the proper answer for Belfast”. Maybe if they had been accompanied by some less technical colleagues they would have discerned the problems “a large, noisy, elevated concrete structure through a residential area” were already causing in those US cities? Planners in Belfast overrode concerns that “the visual impact of an elevated structure can be considerable” and the reality that “the noise pollution from traffic is much reduced by a depressed road” and sought to avoid the high water table with an above ground road on “a series of isolated foundations” that wouldn’t require “the wholesale removal of all existing utilities”. 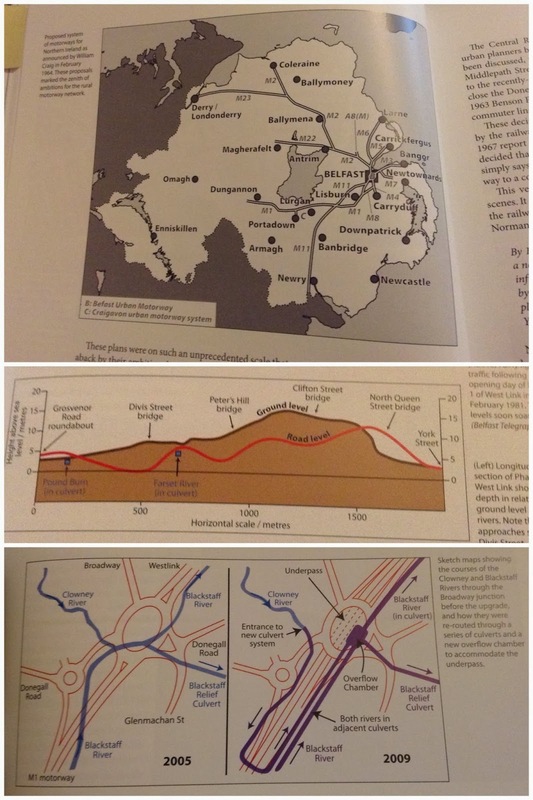 The 230 page book dips into the DRD archives and others which remain, and is richly illustrated with hundreds of photographs, maps and diagrams showing how the evolution of road schemes in Belfast (and beyond). Subsequent inquiries in 1972 and 1977 had more vociferous input from community groups and unions, though often their voices were ignored or dismissed. In 1972 the Sandy Row Redevelopment Association called for the Urban Motorway plan to be rejected before their community was “annihilated”. The four main church denominations argued against the scheme that would “‘box in’ residents and physically prevent the reintegration of segregated communities”. SDLP representatives, the Republican Clubs (Official Sinn Féin) and the Greater West Belfast Community Association all voiced their concerns. The editorial line taken by Belfast newspapers seem consistent with 2014. In 1967 a Belfast Telegraph front page “proudly proclaimed” that the Urban Motorway plan would “shape the [future] Belfast of 1976” employing over 2,000 people and having a much reduced effect on housing than earlier schemes. Besides “a large proportion … would have been due for slum clearance”. There’s a definite class dimension – gentrification – to the road schemes. Less than a third of poorer households in 1966 Belfast owned a car. Yet their houses and amenities were being pulled down to make way for the largely middle class commuters at the expense – for a long time – of any investment in public transport. A 1970 vesting order for the first phase (which became the Westlink) required the compulsory purchase of 1,2000 houses, over 200 shops and businesses, 27 pubs, 6 church buildings, 3 schools and 2 police stations. The Urban Motorway encircling the city was to be accompanied by the appallingly named Central Distributor Box: an inner circle with two or three lanes in each direction, punctuated by traffic lights and directing drivers towards their final city centre destinations. Over half the ‘box’ was built – Millfield, Frederick Street, Dunbar Link, Custom House Square, Oxford Street, Victoria Street – but the southern end is still missing. By the mid-1970s planners were wondering how best to balance transport investment in roads versus bus and rail services. Rail improvements were quickly ruled out, and only came back in 1988 with an all-or-nothing compromise plan for a single-track cross-harbour viaduct connecting York Street with Central Station built alongside the Lagan Bridge. By the mid-1980s the Westlink – the ‘West Tangent’ of the original Belfast Urban Motorway plan – was open. Within a few years traffic was “far in excess of any forecast”. The induced traffic effect means that “if you provide [or improve] a road then it not only caters better for traffic that is using it, but also allows more people to make the journey”. In more recent times, the Lagan Bridge transformed links from Bangor and Holywood to the M2 and the Westlink. A third lane was added to the M1 from Blacks Road and plans to build a flyover at Broadway roundabout were changed to an underpass along with a major civil engineering effort to divert the Clowney and Blaskstaff rivers through artificial culverts. (They wimped out of running the rivers through the roof of the Broadway underpass!) Chapter 13 of the book includes analysis of the Broadway flood when the underpass filled up with water in a mere 45 minutes on 16 August 2008. The Westlink is only the third busiest stretch of road in Northern Ireland, behind the M2 and M3 (Lagan Bridge). Future investment in Belfast’s transport seems sure to involve more bus lanes, rapid transit routes starting at out of town park and ride sites and terminating in the city centre, and the removal of traffic lights at York Street through a series of underpasses and ground-level roads connecting the Westlink, M2, M3 and other local streets. Wesley Johnston’s new book has changed my commute. I no longer drive along the Westlink wondering whether the traffic will snarl up around the next corner. Instead my eye is caught by the detailing on the walls and railings, the timbre of the undulating road, and the remnants of streets that once stretched across the concrete hole that today carries traffic across the city as I remember Wesley’s commentary on the building, rebuilding and human cost on the communities it passes through. As I drive along I ponder some of the questions at the end of the book. Should heavy goods traffic have been given its own lane along the Westlink? Would the Westlink improve if a junction/sliproad was removed? And what kind of transport will best service Belfast, those who live there, those who work there, those who travel through, and those who rely on flights and ferries and goods shipped through the docks? Does our economy suffer if we don’t invest in transport? Can we afford not to share public behaviours by the type of transport solutions we build? The book sucked me in – like an extended documentary – with its study of Northern Ireland’s changing transport strategy, shaped by politics and economics as well as what civil engineers thought feasible. The maps and diagrams bring the history and engineering to life. The Belfast Urban Motorway is written by Wesley Johnston. Available for £15 from its publisher Colourpoint, as well as local bookshops and Amazon. You can also follow local transport developments on Wesley’s website and blog.